According to a recent poll from the Des Moines Register and Bloomberg, Iowa’s Republican caucusgoers love Ben Carson. And what they specifically love about Ben Carson is that he is a Muslim-hating, Holocaust-revising lunatic with no political experience whatsoever. In other words, Iowa Republicans love him because he is them. As you can see from the questions above, Iowa’s GOP base is not at all bothered by the insane, wildly inaccurate things that have fallen out of Carson’s mouth in recent weeks (and months, and years). 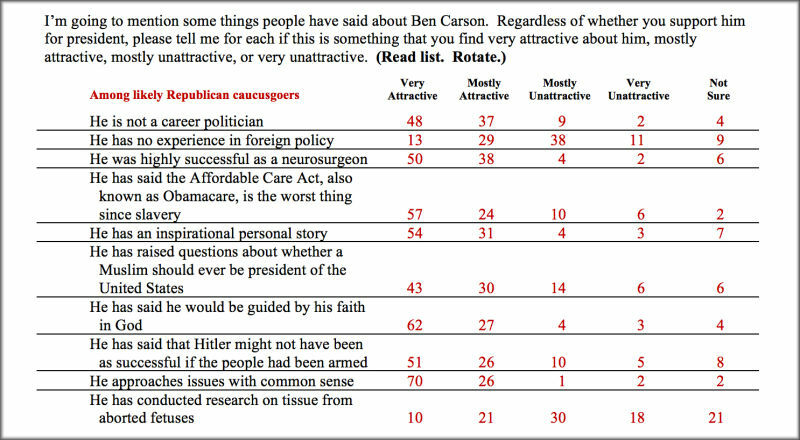 In fact, a 57 percent majority of “likely Republican caucusgoers” find the fact that Carson said the Affordable Care Act is the worst thing since slavery to be “very attractive.” What’s more, a whopping 81 percent of respondents found that belief attractive in any capacity at all. Carson isn’t the only one whose worst qualities seem to be what Iowa Republicans admire most. Carly Fiorina practically destroyed HP single-handedly. Does that bother her potential voters? As you can clearly tell from these poll results, 96 percent of likely Republican caucusgoers value “common sense.” The full poll results are below.